So here we are, immersed in the joys of 2019, but still with a reflective mind to 2018. If not for an exceptionally busy end of year for Liminal 11, this would have been written earlier. So please forgive the tardiness. 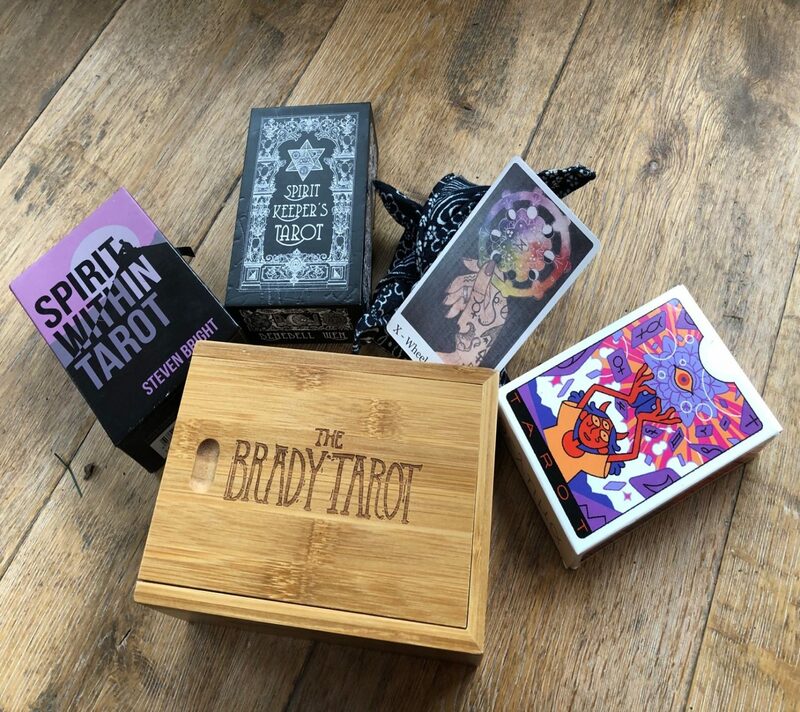 Each year, the number of high quality tarot decks seems to find new peaks, whether self-published, through established companies or with the emergence of new publishers (tip of the hat to Liminal 11!). It really does seem to be a golden age to be a tarot enthusiast or collector. Are there too many decks to choose from? Personally, I think the wide variety provides the space to find a deck that connects more deeply with you… as for the extent that it is a problem, then it is certainly a premium one! With that in mind, and a nod to Instagram’s Tarot Goddess #31daysoftarot challenge, here are my favourite decks from 2018. It has been difficult enough to limit this to just 5 decks so please ignore the order, there has been no attempt to rank these amazing works. Also, Mike Medaglia’s Luna Sol Tarot has been excluded from this list as I feel somewhat too close to that wonderful deck, but hopefully Mike will forgive me given that it has appeared on more illustrious reviewers‘ lists than my humble one! My eyes just popped at the quality of production here! 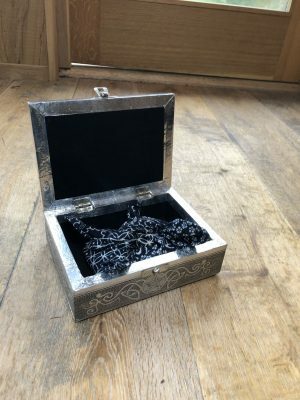 The bamboo box with beautiful engravings and sliding top is just exquisite. 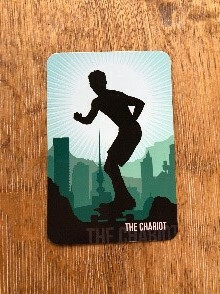 The cards are cushioned within a padded natural interior, giving the impression that every time you reach for them you seem to be waking them up. The cards are gilded but following the theme of nature it is more of a soft satin finish than a reflective one. The cards colouring is off-white, again giving a more natural look. All of this aesthetic perfectly the theme of the cards, namely tarot as seen through the natural history of North America. It might seem odd to focus so strongly on the production, but this is one of the purest examples of how the physical experience of the deck can prepare you to interact with the cards themselves. The tactile warmth of the wood. The sound as it slides open. The bed, both rough and soft. The solid feel of the card stock tempered with the gilded edge against palm. 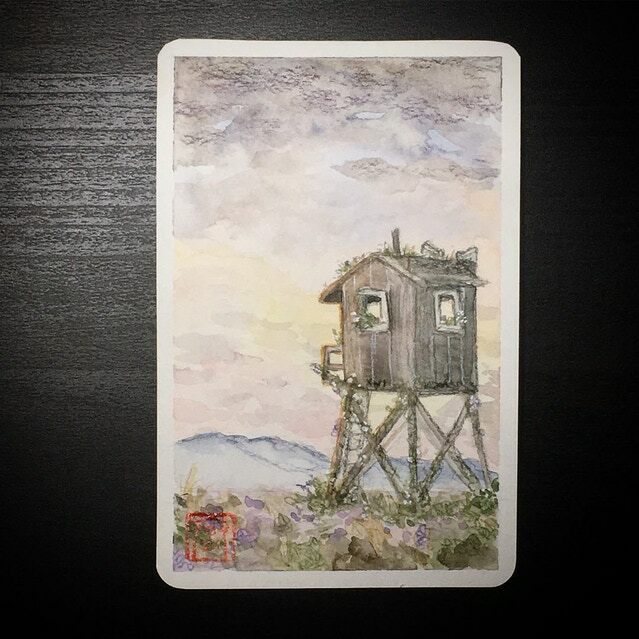 Again, not only does each step prepare the mind to interact with the tarot, it brings the connection with the theme of nature ever closer too. All this before the wonder of the cards themselves – because, as exemplary as the quality of the production, it was the art that first drew me in. The wildly talented relief printing techniques employed by Emily has created work that begs to be framed. Or, to put in context, for me this is some of the finest artwork that appeared in tarot this year. Given the quality and quantity of new decks out there, that is high praise! Again, style perfectly matches theme. The flora and fauna feel so at home in Emi’s craft. You know a deck is something special if I can go this far describing it and still hold back that Rachel Pollack is the author of the accompanying book! Not only does that tell you the book itself is utterly wonderful (which of course it is) but also that as a guarantee of quality, as it takes a very special deck to have Rachel Pollack’s association. 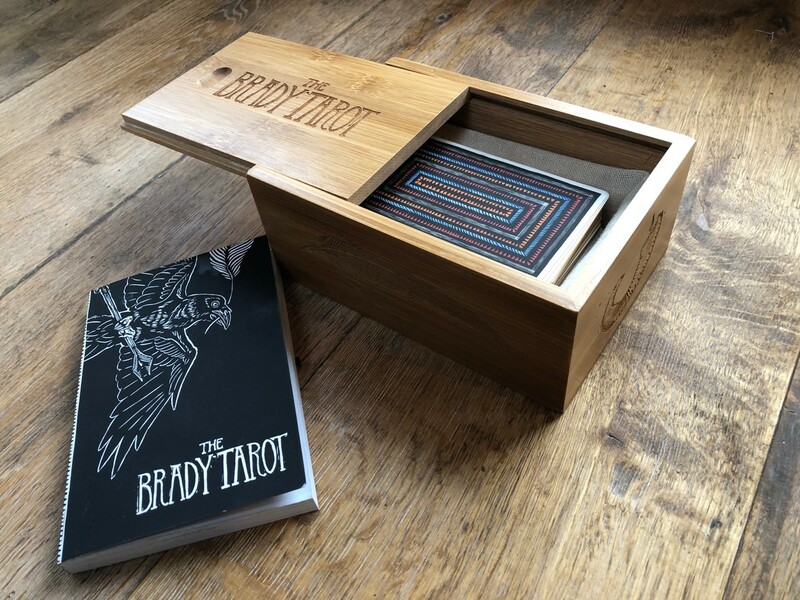 The Brady Tarot is a masterclass in bringing perfection to every detail and imbuing a deck with love. You may have surmised that we here at Liminal 11 love comics AND we love tarot AND we really love comics people that make tarot!! So it’s no shock that the very talented comics creator Joe Sparrow (please go read Homunculus at your earliest convenience!) has produced a deck I absolutely adore. 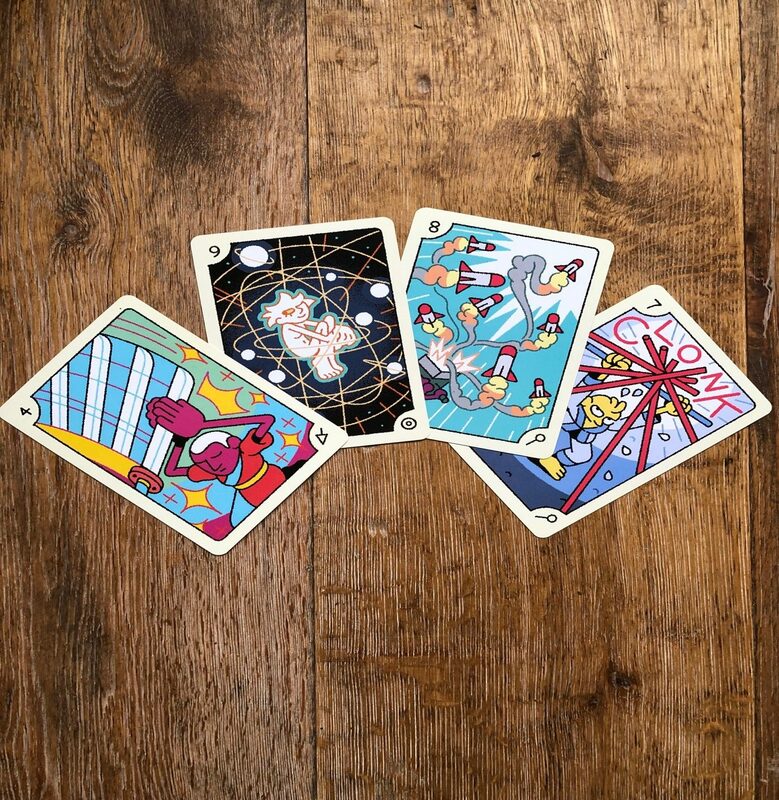 If you are interested in the tarot, then I’m taking few risks in saying you are probably the sort of person who has a keen interest in the future. 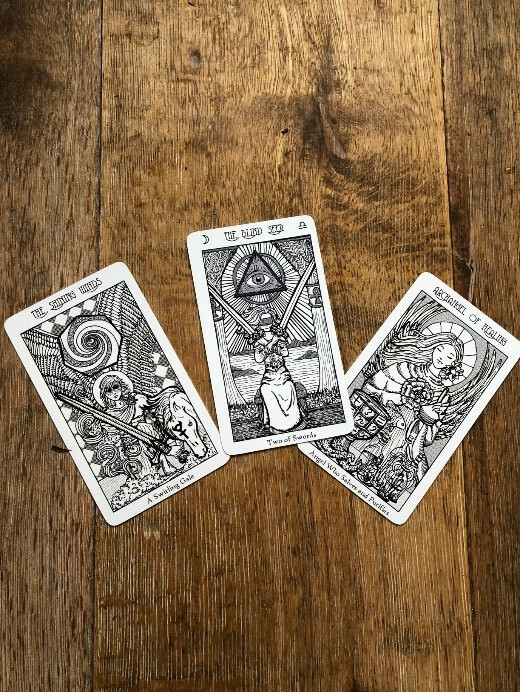 Tarot’s future will have many paths, and the traditional physical cards will no doubt always be with us, but here you can see the early signs of another path altogether. One in which the images are no longer static but increasingly fluid and interactive. It’s no exaggeration to say that this blows open a whole new dimension for both creators and readers! Or in other words, WOW! When a deck is connected to someone who as spiritually sharp and rigorous as Benebell Wen then it’s development in itself can be a matter of marvel. 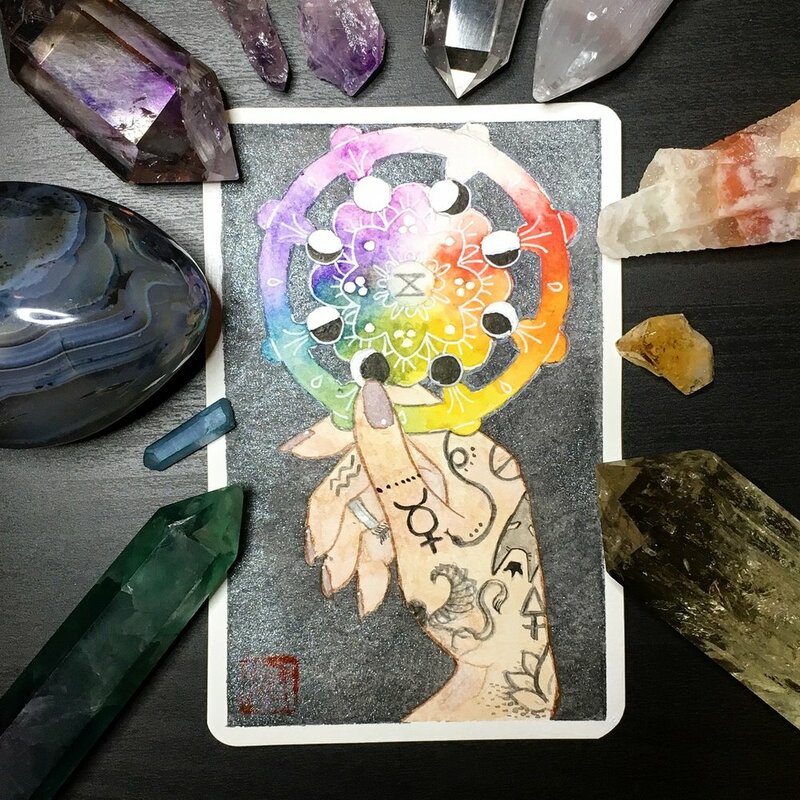 In June 2018 images for the Spirit Keeper’s Tarot started to appear on social media – given that this was created by the writer of the brilliant and highly acclaimed Holistic Tarot (an absolute must for any tarot reader!) it is no surprise this caused much excitement. At first this was an exercise in personal development but as with all great teachers it soon became something so wonderful that Benebell thought it right to share with the world. It took 38 days to create, which for any deck would be remarkable but when you see the depth of thoughtful symbolism and beauty and care in the hand drawn art it becomes utterly mind blowing! Whilst this speaks to a level of dedication and focus that is way beyond many, there is more to it than that. I’m reminded of chat that I had with extremely knowledgeable Geraldine Belkine of Atlantis Bookshop. Geraldine spoke of another deck and said that it’s cohesiveness and ease of reading was partly due to how condensed and focused the time spent on it was. The Spirit Keeper’s Tarot is a perfect example of this. The philosophy, art style and depth of each card is as true to itself as it is to the deck as a whole. 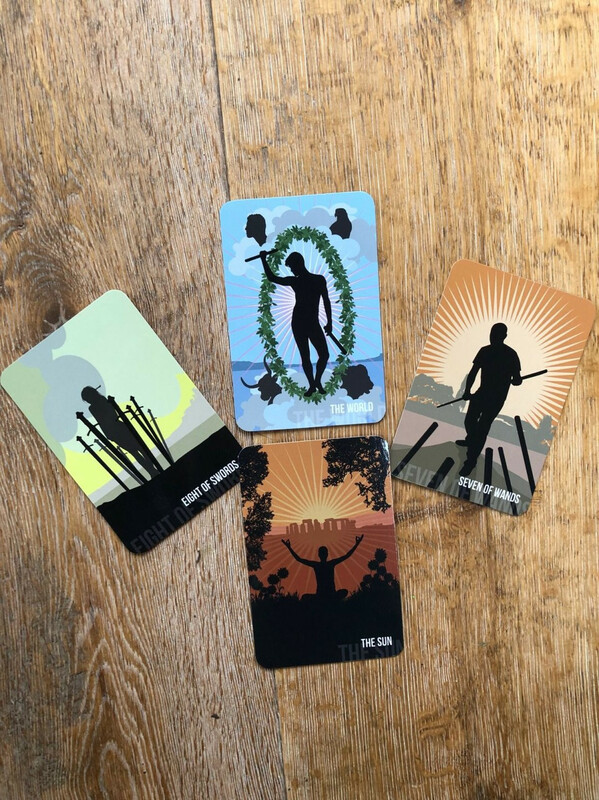 This matters greatly – it is fairly rare you perform a one-card reading, more often you draw multiple cards and study the interaction between the cards as much as the cards themselves. If the cards were not created with a singular frame of mind then you will soon encounter difficulties relating one to another. In contrast, reading with The Spirit Keeper’s Tarot is a delight! Their unity shines through making connection with your intuition a much easier, fluid process. There is so much to love here – even the title – and the grounding intention to create a deck that provides a connection to a roster of spirits is sublime. The beautiful symbolism applied is a bridging between the Rider Waite Smith and the Thoth tarot, with an emphasis on Hermeticism. These decks are the cornerstones of most people understanding of the tarot thus The Spirit Keeper’s Tarot will resonate naturally with many. That said new ground is gloriously broken. There are plenty of elements that innovate and delight – perhaps one of my favourites was the Pages. These are often described as messengers but the obvious question is of what? Didn’t I come to the tarot in the first place for answers? 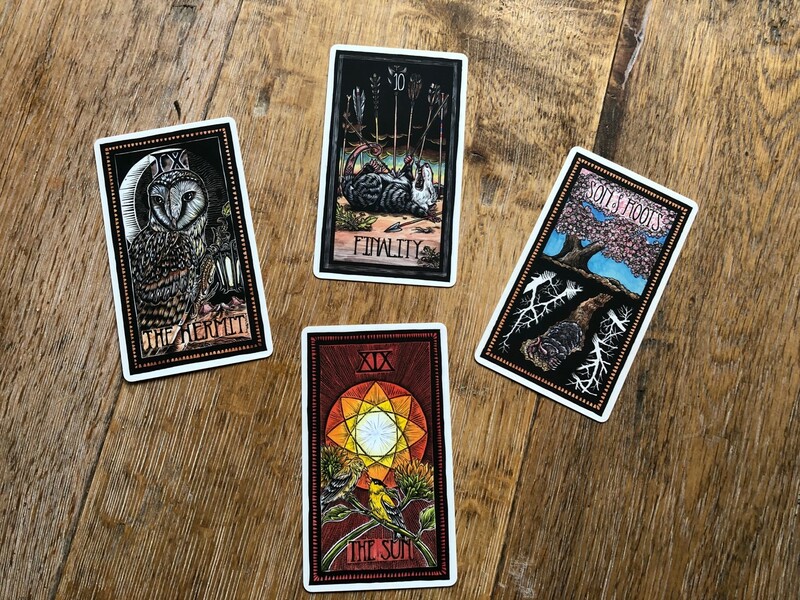 The Spirit Keeper’s Tarot Pages all have sealed envelopes in their imagery and there is explicit instruction to draw another card to see what the message is. Query answered! 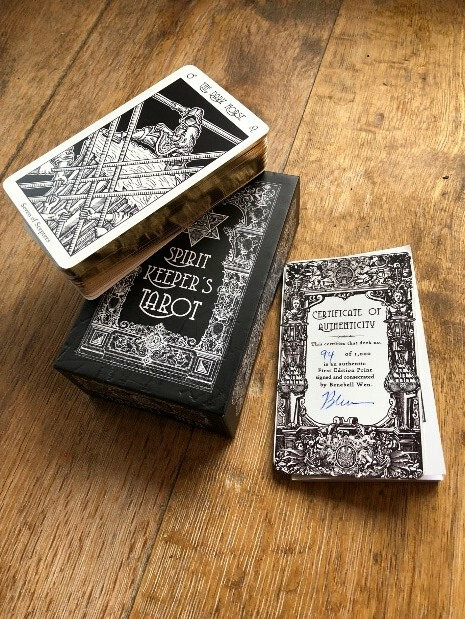 The stunning first limited-edition print run, with each deck hand anointed, sold out unsurprisingly fast but the good news is that a new Vitruvian Edition in monochromatic sepia tones is in pre-order now. I heartily recommend you place your order soon! Ok, this was a late 2017 deck, but it is here by virtue of becoming a treasured part of my collection in 2018. 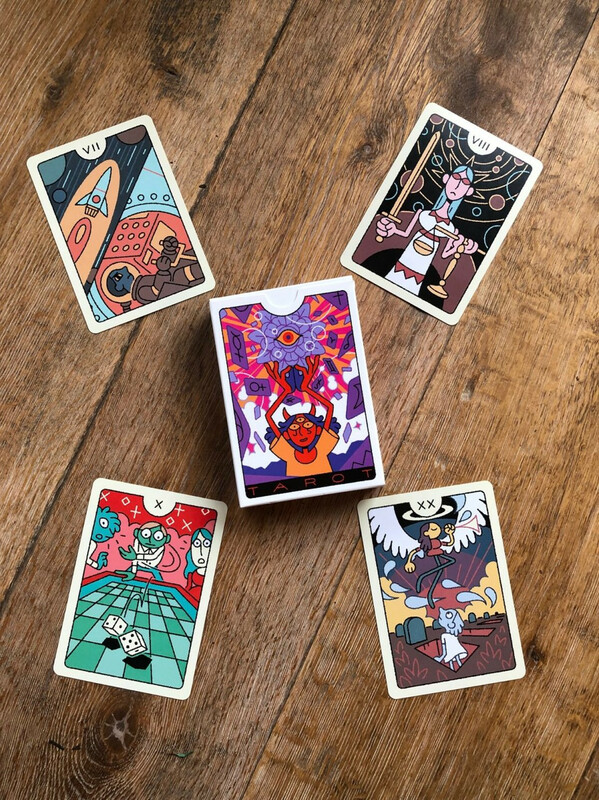 Whilst some have followed The Spirit Within Tarot’s style since its publication, this is a deck that had a wonderfully fresh approach andcontinues to stand apart with the beauty of it’s art and clarity of it’s vision. The central images of The Spirit Within Tarot are modern silhouettes standing before layered landscapes. A focused colour palette complements the scene with separate colours associated with each of the suits. The light source is a strong feature in many of the cards – whether dynamic, as seen in much of the Wands, or more static and moon-like, as seen in the Cups. The joy of reading with these cards is that the imagery is open and easy on the eye. You are not tangled up in the depth of one card or a collision of colour, making a spread read as one picture rather than a bunch of separate images doing their own thing. The silhouettes provide a space to project within – when it is no one it can be anyone. There is something in the shadows that sparks the intuition too, as if speaking more directly to the relevant part of mind. And it’s remarkable how expressive the silhouettes are! As if by focusing the human form, as opposed to the face or clothing, you tap into a more emotive response. Or in other words your gut reaction is triggered much quicker – surely that’s just what you wish for in a tarot deck! The Spirit Within Tarot works on many levels and for many types of tarot readers. The symbolism is classical enough for those familiar or learning the Rider Waite Smith approach to feel at home. But there are enough modern twists to interest someone who already owns a classical deck or indeed is a collector (look at that energy-fuelled skateboarding Chariot, below, for example!). 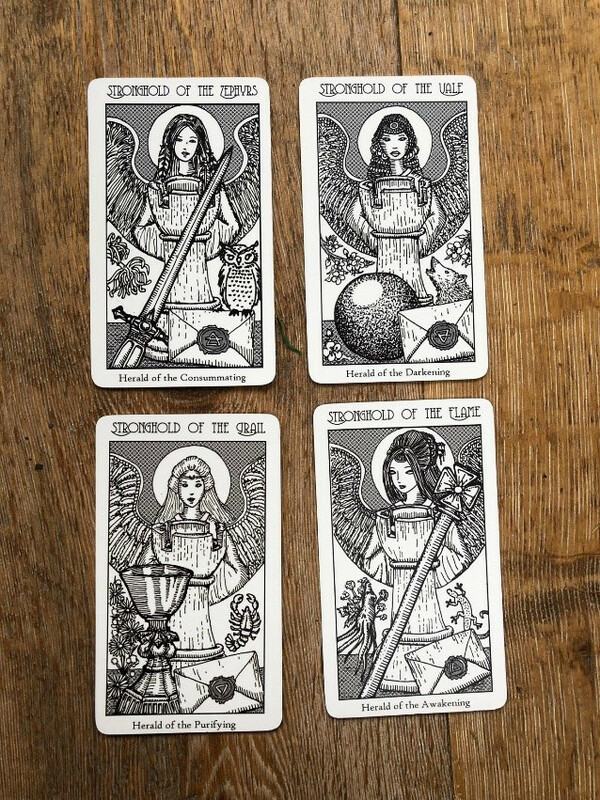 In its clear, uncluttered imagery it works very well as a beginner’s deck but provides something different enough from traditional tarots to attract a more advanced reader. 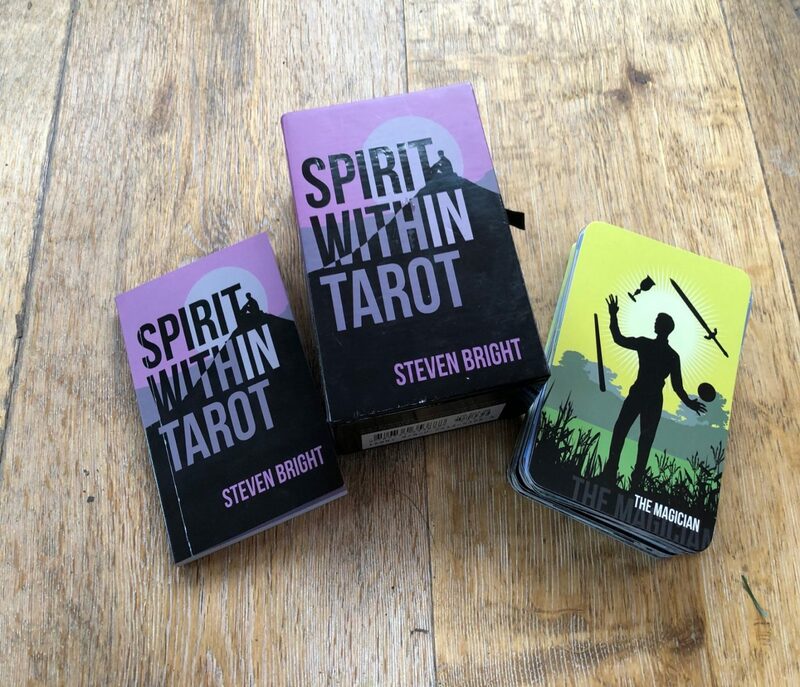 I was fortunate enough to speak to Steven at the London Tarot Conference last year. As an experienced tarot teacher he mentioned that he was motivated to create The Spirit Within as a deck for his students to work with. That says much about the focus and clarity brought to the creation of this tarot. The experience and reflection of not only the creator, but of others treading the path and what he saw in them, has helped form The Spirit Within’s unique approach. With such a pure motivation it is no wonder this is such a remarkable deck! I finish with a deck that has depth and connections both at a community and personal level. Addi Miyako successfully completed a Kickstarter in February 2018 for the Major Arcana; all in stunning and distinctive water colours. The decks came either in a velvet bag or furoshiki wrapping cloths, produced by a local San Jose business, Nichi Bei Bussan. How Nichi Bei Bussan were connected to her family and ultimately Adi’s interpretation of The Tower was covered beautifully in an interview Addi did with us last year – please go read! Not all tarot creators’ inspirations come from a cosmic scale. Once you start looking at the cards and see their individual stories everywhere in your life, it can be almost impossible to un-see. Anyone who has spent much time with the cards time will experience this, but going through the process of creating a deck seems to accentuate it. It is brave to pull those experiences – and those of your family and community – back into the cards and make them at the forefront of your creation process. And this why The Tower in this Major Arcana has such a quiet, devastating impact. Many of the cards focus on a simple profile of face, such as The Hermit, The Sun and The Star. To convey grand archetypal themes in an expression or glance again boils down so much to very human level. We live through these events on just this scale – how natural to reflect them with subtlety and grace in a form we can empathise with. Whilst writing this I learnt that the accompanying Minor Arcana are in progress, and they look incredible! Follow amiyakom on Instagram to see more. All of these decks are either available or open to pre-order in new editions – see the links above. Please support these fabulous works and, just as importantly, do yourself the kindness of bringing some of their wonder into your lives! What were your favourite decks of 2018? Let us know in the comments, or hit us up on Instagram!